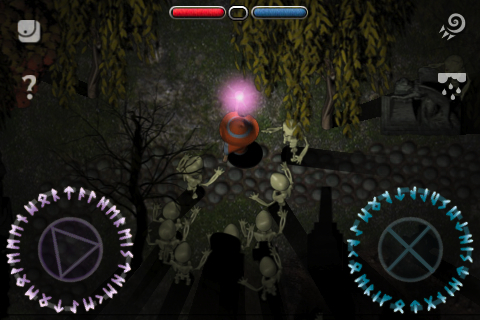 Solomon’s Boneyard is a dual stick shooter game for iOS but instead of using guns and high tech weaponry you use magic. Depending on the character you pick, he or she can use fire, ice, lightning, or the classic magic missile to attack. Each character has specific skills to use in battle. The character you pick has an attack skill, a secondary skill, and a third skill you can choose if you can get it at random. This game is about surviving the endless waves of undead and other creatures Solomon Dark will send at you. Raptisoft who made Solomon’s Keep also made this app. Solomon’s Boneyard runs on the iPhone, iPod Touch and is compatible with iOS 3.0 or higher. Solomon’s Boneyard shares many similarities to Solomon’s Keep but instead of moving from room to room, you stay on one map and try to survive the endless onslaught. 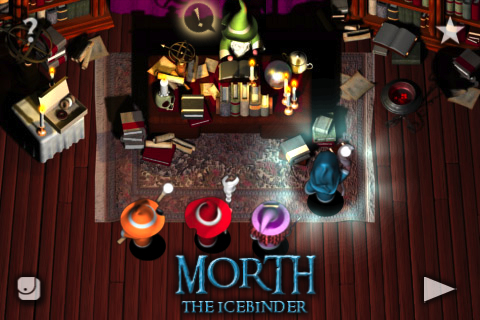 From skeletons to fiery creatures, your enemies will become stronger and will eventually reduce you to only a hat and a staff. Left stick is for movement and the right is for attacks. Mana is used for attacks so be careful of wasting it. Mana regenerates slowly so your attacks will be at its basic state if your mana is low. The best way to attack is to press rather than hold. You can equip up to two magic rings that will boost your abilities such as gaining more experience points, more mana recovered, upgrade one of your skills by a level, etc. You start the game with one health and mana potion and try to survive as long as you can. You start at level one and try to gain experience to gain more skills. I recommend getting more health and mana (max of four upgrades including boosts from rings) unless there is a skill that you really want. Skills are random so you may not get what you want when you want it. When you die, you can pick another character to use or use the same one, but you’ll always start at level one. You keep the gold you collect from defeated enemies. This game starts out slow since getting enough gold to buy what you want can be difficult. The amount of gold being collected is not very much but can be increased by buying certain perks. I suggest buying the more gold drops perk and enabling bosses. I also suggest unlocking more slots, more drops perk, the master of offense, +2 and +1 to all skills, and the magic inventory. The enemies will get stronger and will eventually kill you. Just be careful and have fun. The graphics are the same as Solomon’s Keep. Everything looks sharp and polished. The setting can be gloomy but that depends on what area you’re playing. Selecting where to go is something you’ve have to buy using the gold you collect. You can see your health, mana, and experience points. Your runic circles (movement and attack sticks) are fitting and help enhance the atmosphere of the game with the gloomy feel of the area you’re in. You can see a basic shadow cast from a tombstone, a flickering light from your staff, etc. When skeletons are killed they will break into piles of bones while other enemies will burst into light. When you level up, a bright light will fill the screen and slow down enemies. Coins and ring bags will stay on the field until you die. Your character will be bleed when attacked. The game will warn you when you’re running low on health. Be careful of killing enemies near the edges of the screen since the item drops will be stuck there. This can be fixed by using the telekinetic skill. Certain drops will disappear such as health and mana orbs or the quad damage item. Some enemies will look similar but will attack differently such as archers using poison arrows. Bosses will be the same but colored differently and have a new attack until a certain point. The audio for this app helps the mood of the game. The music is a bit eerie but fits very well. It can be repetitive to some but I enjoyed it. The sound effects help tell you when a certain type of item drops. There is no iPod music support. You can hear Solomon Dark taunt you. He might say the grave he is digging is for you or leveling up won’t do you any good. I feel this is an entertaining aspect of the game. Solomon’s Boneyard is free. There are in app purchases but they are not necessary. This game is easy to pick up since whenever you leave the game, it will let you resume where you left off. You can buy other characters who have two attack skills which can be fused together. They only need gold to be unlocked. I recommend using single attack spell characters most of the time. This game can be repetitive but I didn’t feel that way. It can also be challenging but I think that is a good thing. It will start off slow but if you have the patience this will be an enjoyable app for some time. I think this is a well done app. I would like to say thank you to Raptisoft for making it. AppSafari review of Solomon’s Boneyard was written by Tony Lau on February 1st, 2012 and categorized under Action, App Store, Games, RPG. Page viewed 6893 times, 1 so far today. Need help on using these apps? Please read the Help Page. This game is a sheer blend of action , suspense, humour . I really liked the graphics and sound quality . Keep it up !! I just played! This game deserves 5 stars!